Leading power and automation technology group ABB and Samsung have been awarded a contract to supply a hybrid Grid Energy Storage and Diesel Generation System (GESS) to SP AusNet for its electricity distribution network in Victoria. Featuring a capacity of 1MW-1MWh battery energy storage as well as 1MW diesel generator power, the GESS system will be a pilot plant for similar grid-integrated generation and storage systems in the future. If successful, SP AusNet may choose to embed GESS systems for additional supply capacity during high demand periods to offset or delay expensive investment upgrades of power lines. Scope of supply for ABB and Samsung includes the design, engineering, construction, testing and supply of ABB's PowerStore battery system and a 3 MVA transformer to be integrated with the diesel generator. The plant is managed by ABB’s new Microgrid Plus System and implemented as a transportable power station consisting of seven outdoor containers and kiosks. The GESS provides peak demand management, active and reactive power support and other power quality functions, when the network is connected. 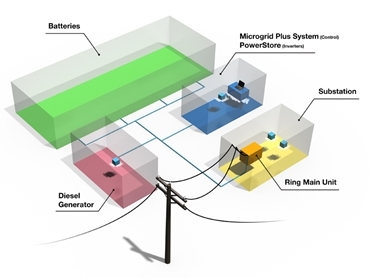 It can also provide power as part of a mini grid when parts of the network become isolated. The battery system and smart inverter are the primary energy source, while the diesel generator acts as back-up to extend the capacity available. The system must comply with the distribution grid codes when grid connected, must transition into island mode when the network controller gives the command, and must switch back to grid-connected operation without any power supply interruption. SP AusNet selected ABB due to its leading technology and local engineering capabilities to solve the challenges of the complex embedded generation system. David Baker, ABB’s division manager for Power System in Australia explains that they had the opportunity to demonstrate to SP AusNet the value of leading-edge technology available at its doorstep. The project is due to be completed in 2014 and ABB will continue to support SP AusNet with an ongoing service and maintenance contract for a further two years after final commissioning of the Embedded Generation system.